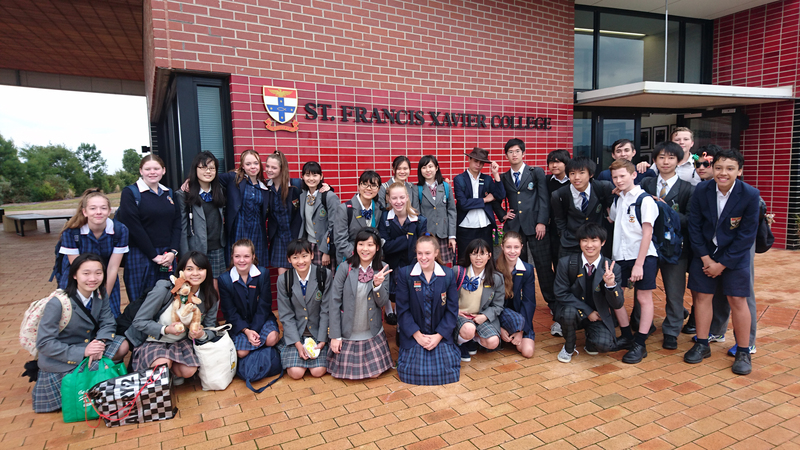 At St Francis Xavier College, we are fortunate to participate in a wide range of exchange programs to benefit student learning. We also host a Japanese Intern in Terms 2 and 3 who assists in each of our Japanese classrooms. Each campus hosts students from a range of schools across Japan. On a daily basis, during our exchanges each campus is buzzing with many students practising their Japanese greetings and introducing themselves to each of the students who arrive. Many of the students take this opportunity to enhance their knowledge of both the culture and language of Japan. Our exchange students participate in all classes with their host brother or sister, giving other students a chance to meet and talk to them and engage in learning. The students also have an opportunity to participate in some Australian culture classes including an AFL clinic, baking ANZAC biscuits and learning about Aboriginal culture through art. At the conclusion of each day, the exchange students return home to their Australian host family and immerse themselves in Australian culture. It is usually during these times when many strong friendships and memories are created and formed. The opportunity to host exchange students is a valuable and rewarding experience for our students. Through cultural exchange the students learn more about life in other countries and the similarities and differences between Australia and the world. It is through the generosity shown by families in our community that such exchanges are possible and so many at our College can benefit.